Every month on the third Tuesday. Food & drink specials, door prizes, DJ music and 50/50 drawing for Children’s Miracle Network. Every month on the third Tuesday from Sept thru May. Sponsored by The South Central Florida Car Club. Come out and enjoy an evening of like minded automotive folks. We grill up some hot dogs and provide lots of extras and drinks too. So dust off your ride, grab up your bride and head to the park. See ya there. Every month on the third Tuesday. Hosted by Better Jacksonville Beach, and held along 1st Street North between Beach Boulevard and 6th Avenue. Map is approximate. Vehicles will be selected each month to be showcased in the Sea Walk Pavilion and Latham Plaza in Jacksonville Beach. Other attendees are encouraged to use the public parking lot adjacent to Latham Plaza. 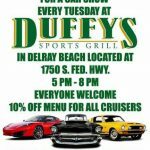 Join the BMW Club of Orlando on the third Tuesday every month. Open to all BMW, free event, rain or shine.